I noticed several years ago how much better a party was when you had a massive hard drive full of MP3s to DJ from instead of a pile of badly organized cds. This was no problem when the party was at my house, but what to do when its somewhere else? Moving a whole PC setup across town (or cross-country) was too much trouble. I considered getting a laptop, but they seemed too expensive, have small hard drives, and aren't upgradable. 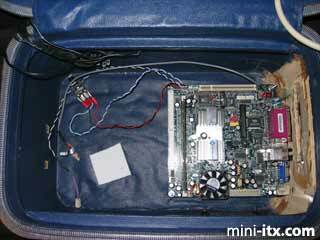 Then I stumbled upon Mini-ITX.com <cue church music>. 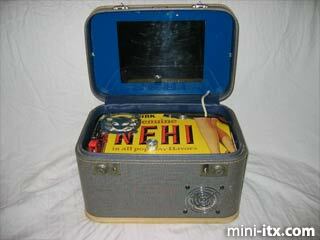 I was very impressed with the Lunchbox PC. Compact. Stylish. It didn't look like an insane amount of work. As I shopped around for the right box (Underdog, Hong Kong Phooey, etc) and measured out what I wanted to put inside it, I realized a lunchbox wasn't going to be large enough. 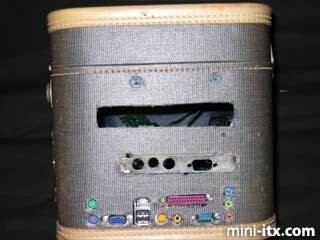 Even if I managed to squeeze in a dvd player, I'd still need to carry around something to put the mouse, keyboard, and power cables in. I spent the next 2 weeks critically examining any object bigger than a lunchbox, but smaller than a PC. 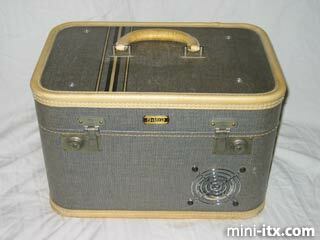 Finally, wandering through a thrift store, I found it - a vintage Osh-Kosh vanity case. It was perfect - sturdy construction, plenty of room, portable, retro stylish, and slightly absurd. The lid was begging to have a monitor built into it. Not wanting to spend a fortune, I was about to buy a crummy 5" playstation monitor when I came across this 10.5" LCD for $100, which fit the lid precisely. 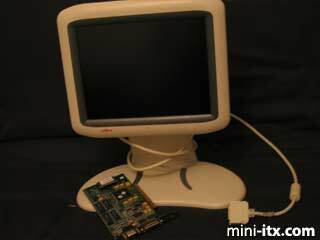 As an interesting bonus, the monitor is powered from its own pci card -saving me the trouble of another wiring connection. I stripped the LCD panel out of its casing and screwed it to the lid. 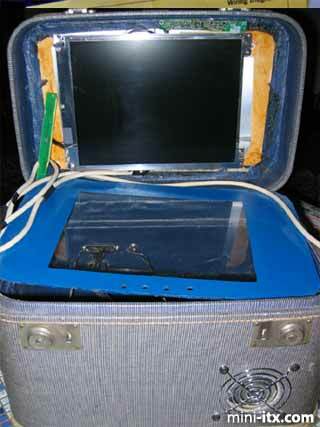 The bezel was cut out of Lexan, masked, and painted blue. Now it was time to break out the dremel and cut holes for the various ports. You'll notice from the photo that I didn't do the best job here. It turns out the reason the luggage is so sturdy is because the walls are made out of 1/8" hardwood - which made it difficult to get the motherboard and the holes lined up. I cut a hole in the front for ventilation intake, and one in the back for the power plug. Here's a shot of the motherboard installed. The more observant among you will have noticed notice 2 large slots cut out above the standard ports. One of these is for the DVD player. The other is for an AVI All-in-Wonder VE video card. Why did I need another video card (considering I already had 2)? During early testing using a video projector, I noticed that while the M-9000 plays MP3s with no difficulty, it was excruciatingly slow at running Winamp's Milkdrop visualizations. Now, I really like funky lights with my music, so adding a video card with better 3D graphics became a high priority.